Samsung's mobile division has announced its official line of accessories for the eagerly anticipated Samsung Galaxy Tab tablet computer, including a keyboard dock and a 'multimedia desk dock'. The Galaxy Tab arrives in November, and the 7 inch Android 2.2 tablet certainly won't be accused of lacking add-ons. Samsung has announced no less than 8 official accessories for the Galaxy Tab – although that does assume you have any money left after forking out more than £500 to buy one. Simon Stanford, Managing Director, Mobile, Samsung UK and Ireland said: "This range of accessories aims to complement the Galaxy Tab's features and improve the experience the device offers – whether that's listening to music, watching video content, playing games or editing documents. "We're delighted to be able to announce a variety of accessories available at launch, with even more to come." The peripherals include a keyboard dock – priced at a £69.99 that is only available at Carphone Warehouse until mid December following a November 1 UK release date. 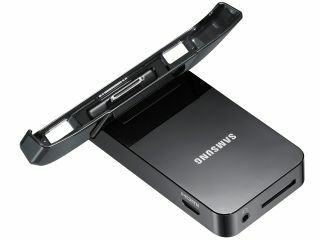 A multimedia desk dock brings a portrait stand and charger with HDMI and 3.5mm audio jackand costs £39.99. There's a 'stylish' notebook case that folds into a stand (£29.99) a leather slip case (£24.99, you can work out what it's for yourself) a D30 silicon gel case (£19.99) and portable speakers (£19.99). Not forgetting official headphones - £20, memory cards (£various) Travel adaptor (£35.99), a seemingly ludicrously priced USB Data cable (£14.99!) and a £24.99 in-car charger. And if you buy them all – you can at least wonder if you could have just plumped for a MacBook.